Day three of my Gradual Exposure Therapy is turning out pretty interesting. I want to keep pushing my limits with my Pee Buddy Mike and see how far I can go, and still be able to pee. First thing in the morning, I need to pee. I have Mike stand in the open doorway with his back to me. I peed in just 20 seconds flat. No problem! A little over an hour later, I tell Mike I need to pee again. I stand at the toilet with the door wide open, Mike comes and leans on the door frame facing me. I laugh, “turn around“. I make him face the other direction. I’m not ready for that. I tell him to act impatient, shuffle his feet, say things like “Come On” “Hurry Up” and “You’re taking too long”. Mike is only a foot away from me and he’s shifting feet. “Pee already” he says “I have to pee myself“. He starts moving and shifting faster. He starts bouncing up and down. I couldn’t tell if he was serious or not. “Move” he says. I’m crammed up by the sink and he’s standing at the toilet getting ready to pee. It actually made me pretty anxious. I quickly turned around so I was facing the mirror. Talk about desensitization! I’m standing there. Mike is in my space and his shoulder is pushing into my back. That’s close! He pees with no problems of course, nothing phases him. I can’t believe I’m doing things that I never thought I could do. It’s almost startling! But I’m feeling more at ease with the whole bathroom peeing thing. The next time I pee, I’m going to up the ante! I have something in mind that could raise the hair on the back of my neck. Will I be able to Pee? Later in the day, I have to pee again. I tell Mike I want to try something difficult. I’m going to crack the door a foot and I want him to walk back and forth in front of the door, varying the speed, intervals and noisiness. I know this is taking things to extremes because he’ll be actually able to see me (not that he’d be looking). So we try this. I’m standing there trying to pee and Mike suddenly comes flying by the door way. LOL He’s running so fast that the wind pushes the door further open. I laugh out loud. Seconds later, he’s slowly walking by the other way. Creeping by. I couldn’t stop laughing the whole time. It was pretty entertaining. Needless to say, I couldn’t pee. Too much sensory overload. The distraction of him seeing me and me seeing him was too much. After 3 minutes of this, I gave up and took a break. We tried again 20 minutes later, but this time we went back to him just standing there leaning on the door frame facing out. Granted, even by myself I can’t go sometimes. I don’t know why. Maybe it’s because my urgency wasn’t urgent enough, or that my anxiety was high, but I tried and couldn’t go. I waited another 1/2 hour, and this time I DID GO! Finally! I’m not giving myself a choice. If you want to pee, that’s the only way! Like it or not! Now comes the fun part. We’re heading to Target to get some goods and I decide to do some Desensitization in their restroom (first time in the field). I normally would never set foot in the public bathrooms, so it’s a good day to try. I didn’t have to pee, nor had any slightest urge, so it was a perfect scenario. 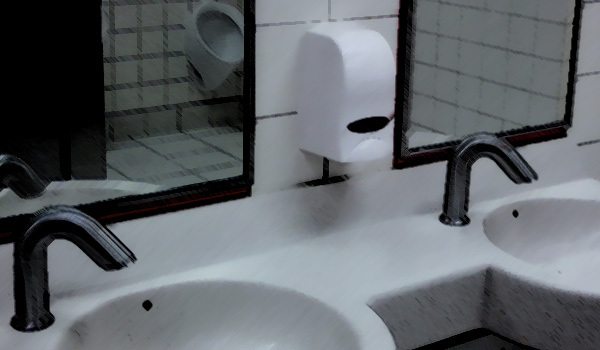 My goal was to do nothing but stand at the urinal… My greatest fear! We head into Target and I instantly veer off to the left to the restrooms. Mike says he’ll wait up front for me. I go into the men’s room with my heart racing. I have no idea what I’ll find. I find that no one else is in the bathroom. I’m all alone. Just me and my anxiety! That’s cool. I step up to the urinal (one of two without dividers), unzip, and act like I’m peeing. I’m happy I don’t have to pee, because that would have made me really paranoid and stressed. I’ve never really stood at a urinal like this. I felt so open and on display. It’s very unnerving. No hiding there! Suddenly I hear footsteps down the hall (yep) and seconds later the door bangs open. The guy quickly steps up to the other urinal, unzips and he starts peeing pretty quickly. Me, I’m just staring straight forward frozen in fear. This is such a new experience for me. I can’t believe I’m here and that some stranger is peeing just feet from me. That’s about the time that the door opens again and someone else enters. GREAT! The guy next to me farts! That ain’t right! I stand there trying to ignore it and I think to myself “How long can I do this?” I’m just standing there and not peeing. Surely someone will notice? Now the small men’s room feels very, very crowded. I can feel the heat on the back of my head. I can’t take it anymore. I decide to bolt! My practice session is over for today. I don’t want to tie up the urinal and keep people from peeing. That’s not cool. So I pretend to shake, zip, flush and I make my way over to the sink. I didn’t pee, but that was not my intention. It was to just stand there. See what it feels like. Mission accomplished! I need to get comfortable with urinals and the feeling of being around other guys peeing and other guys waiting. One step at a time. It’s a lot to deal with, especially being so visible and open. But it did make me feel good that I stood there. I STOOD AT A URINAL!